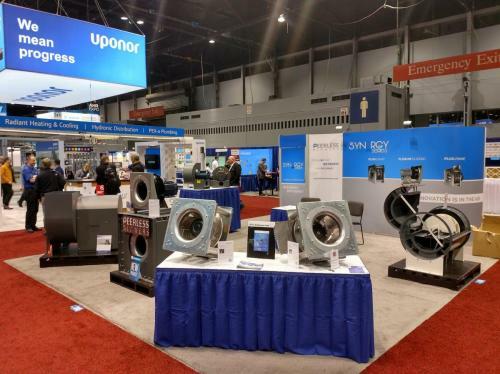 An ISOframe hybrid custom exhibit helped heavy duty, high efficiency, Peerless Blowers’ Synergy Series make an impact at AHR EXPO 2018 in Chicago. Peerless wowed the HVAC industry by showcasing full size Synergy Series Direct Drive Plenum and Plug Fans in their 540 sq. ft. booth which was outfitted with a very unique ISOframe display that combined an attractive ISOframe Fabric exhibit and an ISOframe Wave display. This combination was built for the unique needs Peerless had at this trade show. The exhibit detailed features and benefits of the Synergy Series, showcased additional photos on a vibrant large format dye-sub printed silicone edged fabric and provided Peerless with a locked storage area accessible with a convenient built-in door. Accent Imaging, a Mark Bric Display preferred dealer in Hickory, NC, was the liaison on this project. They teamed up with Mark Bric Display designers to help Peerless select trade show display elements best suited for their sales & marketing objectives. Exhibiting large industrial products is always a visual and logistics challenge. The lightweight and portable nature, of both the ISOframe Fabric and Wave exhibits, was perfect to help minimize additional weight and reduce transport space for Peerless’ at-show-presentation needs. Exhibit choices in the ISOframe family of displays are among the most durable, lightweight, and customizable yet affordable on the market.